Who is Eobard Thawne / Reverse Flash / Professor Zoom? Eobard Thawne is a villain of the DC hero the Flash. He is the 2nd of the Reverse Flash villains that have similar powers to the Flash. Thawne was initially created in the 1960s but re-imagined in 2009 with Geoff John's Flash Rebirth. The Flash Rebirth series set up Thawne as one of the major villains in the DC universe. On TV the character Doctor Harrison Welles played by actor Tom Cavanagh has been revealed to be a version of Eobard Thawne from the future. Tony Todd will play the evil Flash known as Professor Zoom in Season 2 of the Flash. Eobard Thawne is fan of the hero of the Flash in the 25 century. Thawne lives in a time well after when the Flash has died. Thawne recreates the chemical bath that gave Barry his power and becomes a version of the Flash himself. He then travels back in time using a cosmic treadmill device. He lands in the past however he does not go far enough back. The time he lands is right after the Flash has died. He is very dismayed at having missed his opportunity to meet the Flash. A few other things happen that cause Eobard to go off the rails. First the time travel effects his mind, making him unhinged, he also begins to resent the Flash himself for not being there when he traveled back. Entering the Flash museum he learns that he is to become a villain the Reverse Flash and that his childhood hero the Flash is the one that kills him. For a time he galavants as Barry Allen but his highly violent and unstable nature reveal him to be a different person. The first run in with the Flash, is when the Flash goes to the future to stop a bomb going in off in a buried time capsule. He sees another Flash in a yellow costume and seeks him out to gain information. The two end up battling with Barry defeating Thawne. This is the beginning of Thawne full on rage toward Barry Allen. Thawne has used very methods of torturing Barry Allen. He has killed Barry's mother and has sought to kill his wife and children. His ability to travel at super speed and through time make him very difficult to stop. Eobard Thawne has similar powers as the Flash. Has shown the capability of traveling in time. Very intelligent but also emotionally unstable, violent, and unhinged. Doctor Welles in the TV series the Flash has been revealed to be a version of Eobard Thawne trapped in the present. 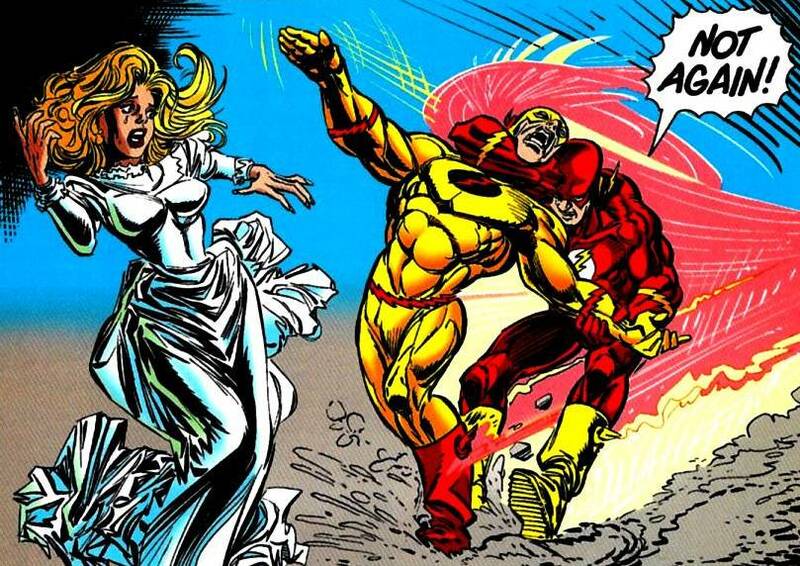 He initially sought to kill and destroy Barry's life and killed Barry's mother. He then learns that without Barry he can not travel back to the future and so he begins to train Barry to become the Flash. It is unknown what effect his actions on the present could have on the future. Is the primary villain of Barry Allen in Season 2 of the Flash. He is played by Tony Todd. The Zoom outfit is much more organic than the Reverse-Flash suit. In a way, it’s hard to tell if it is a suit or alive… There’s no skin showing, for all you know there’s a robot underneath, or dark energy. It also sounds like that his identity may be kept secret. Part of the mystery of the season is who or what is underneath the Zoom outfit, and so we wanted to do something like James Earl Jones as Darth Vader — this iconic voice coming out of this mask. Last year, we thought of the Reverse-Flash as a speed warrior; this year, Zoom is like a speed demon, and no one does demon-voice better than Tony Todd.